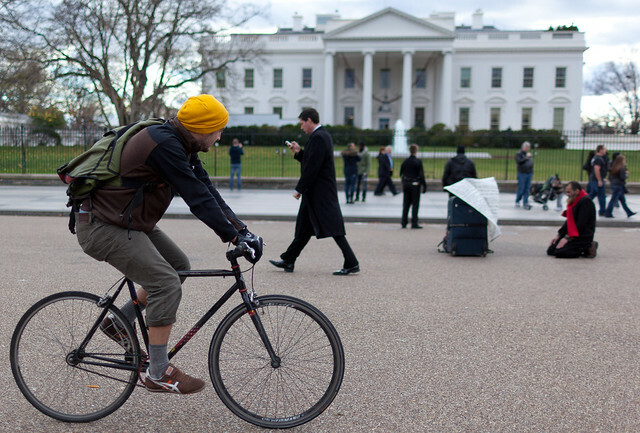 Had half an hour before a meeting at the White House to take some shots of the Washington cycle scene. 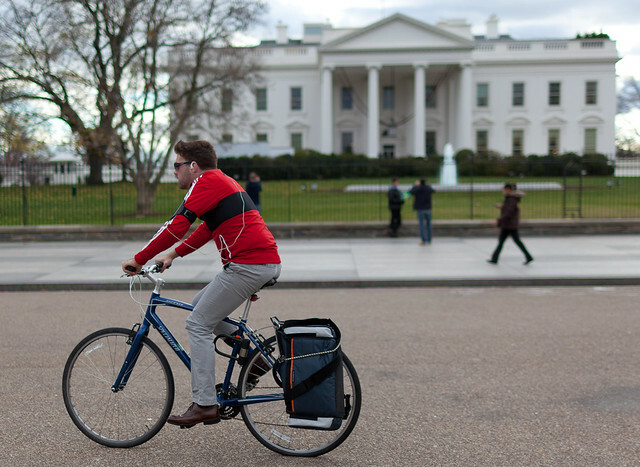 There were quite a few people biking past the White House including a police officer. "Here's the picture to go for" I thought. Alas, when I asked him if I could take his picture he replied with a gruff "No!". 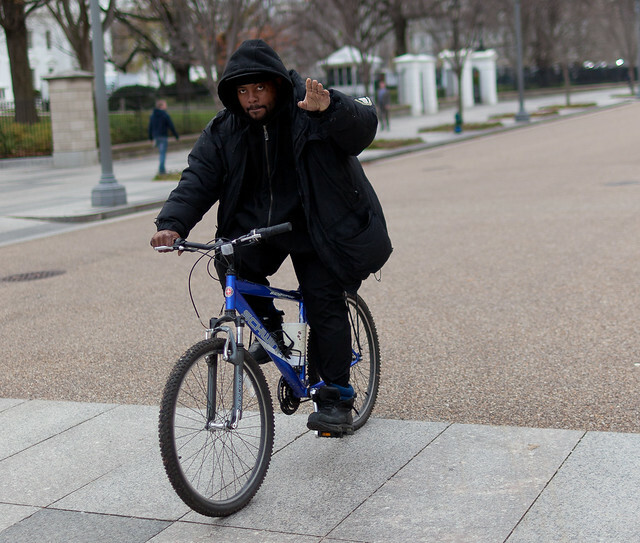 So you will have to imagine the invisible biking police officer vigilantly patrolling the White House Gates. I was pleasantly surprised by the city bike system in Washington - next time I visit Washington I'll try it and report back here. Praying - and protesting at the same time. Cycling is much way better to use then cars. No pollution, no gas to buy, and is a good form of exercise. So nice to see my fellow countrymen in the capital not having to wear helmets. It's such a drag where I live, where the nanny state has prescribed helmets for all. You do not need permission to photograph law enforcement in public places in the U.S.
@Dottie as a rule you are right, however, reality is a little more complicated: http://www.popularmechanics.com/technology/how-to/computer-security/taking-photos-in-public-places-is-not-a-crime. Also I have no wish to publish street photographs if the person involved signals to me, that he or she does not or did not want their picture taken. That the police man did not want to be photographed is not that uncommon in DC, especially if it was Park Police (one of the umpteen police agencies in the District). But, the law is that you can photograph them unless they are in a sensitive area or performing a sensitive task ... neither of which fits cycling past the White House. 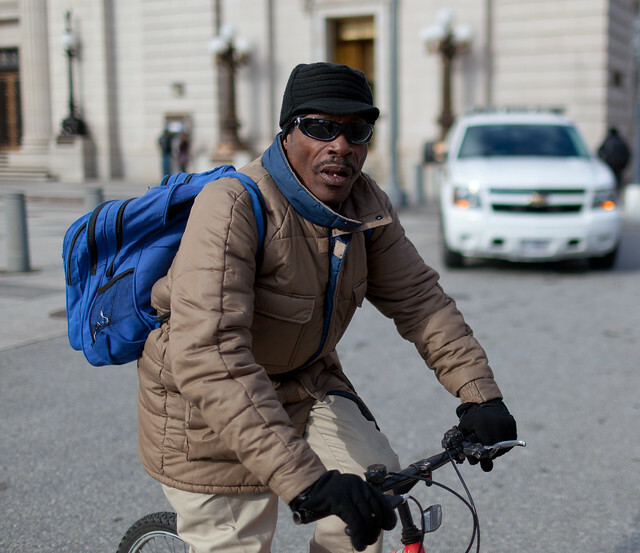 CaBi (Capital Bikeshare) has been around for a little while now and is getting ready to expand again. It will soon have stations on the National Mall and as far south as Old Town Alexandria. Personally, I can't wait for it to get to Alexandria because then I could use it for my lunch commute! Anyway, enjoy our great city! And, if you get a chance, stop by Alexandria ... my neck of the woods around here! I hope you walked the couple blocks to 15th and Penn to see the intersection of the Penn Ave bike lanes and 15th St. cycle-track. Should have been a lot of cyclists there--especially with this weird warm weather. Just wish my shoulder would heal so I could join them. @Anonymous, thanks for the tip. As Arnold says "I'll be back" and will try to make it to 15th and Penn.